Good news! You’ve landed a student internship at the Brantford Bugle and you start today. The only journalism experience you’ve had to date comes from in-class studies so you know you are going to face a significant learning curve. But you’ll get the hang of this job soon, right? In an 11-part interactive video series developed by Bruce Gillespie, associate professor and program coordinator in the Digital Media and Journalism (DMJ) program, students follow the journey of Frankie, an aspiring journalist studying in the DMJ program embarking on her first-ever internship. The on-the-job scenarios created by Gillespie are scripted, but they were developed to reflect the realities of the modern North American newsroom. 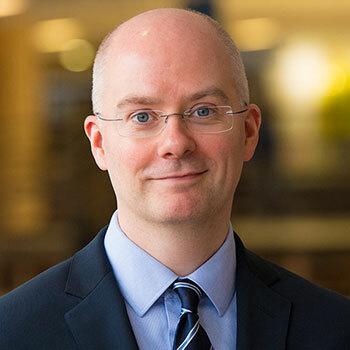 “I took what could have been considered an ‘out there’ idea and created a ‘choose-your-own-adventure’ game for students to connect in-class theory to real workplace scenarios,” says Gillespie, who is also Laurier’s 2017 Teaching Fellowship recipient. The interactive video-and-game modules were developed for the introductory News Writing and Reporting course, which is mandatory for first-year DMJ students and offered as an elective for students in other programs. Students in the fall 2018 term are the first cohort to take part in the new course component. Each episode is a personal video journal entry shot by Frankie, the fictional intern. She recaps her week of activities and issues at her internship. A few videos are filmed at the imaginary Brantford Bugle, where viewers get the chance to meet some of Frankie’s colleagues – usually when they are adding new tasks to her plate. At the end of each video, students are asked to continue the narrative in a game, playing along as Frankie and deciding how to react to on-the-job crises and ethical issues during the corresponding week of her internship. In the second week of her internship, for example, Frankie’s colleague Josh asks her to conduct some community interviews to help him complete a story he’s working on. The catch? The story is due in two hours. Should she head straight out to interview residents, read through Josh’s notes in the hopes of finding something valuable, or call Josh to get some clarification? Once students choose a path, they are asked a series of follow-up questions that challenge them to apply the best practices they’ve learned in class to the situation at hand. Students are always granted the chance to try again by starting at the beginning of the path if their choices result in an unfavourable outcome. These exercises are not graded, providing students with a low-stakes environment to explore the challenges and rewards of working in the fast-paced media industry. The impact of concentrated media ownership and the gig economy on the fields of digital media and journalism. All of these critical concepts are addressed in both obvious and indirect ways during Frankie’s time at the Bugle. In Gillespie’s opinion, novels, movies and television shows often portray journalists as morally bankrupt in an effort to make plotlines more appealing, so he has moved away from using these forms of media in his courses. Since he couldn’t find an engaging and accurate form of media to bring complex course concepts to life, he made his own. Recent DMJ graduate Chandler Berardi (BA ’18) plays the leading role of Frankie during the series. While the Brantford Bugle may be a fictitious news organization, Berardi didn’t feel like the scenes were far from the realities students face in the classroom and in the workplace. Berardi believes that the process of “choosing your own adventure” through the series will have a great impact on students’ interest and understanding of the course material. Prior to his role as associate professor and program coordinator for DMJ, Gillespie worked in Toronto as a freelancer writer and magazine writer and editor for more than 10 years. During this time, he began teaching part time at Ryerson. In 2010, Gillespie applied for an open position on Laurier’s Brantford campus and felt equal parts excitement and nerves when he was hired. “I knew this professional program and others like it had a mix of practitioners and scholars, but I also knew classroom management and public presentations were areas I wanted to work on,” says Gillespie. Soon after starting at Laurier, Gillespie realized that his years of experience working with and mentoring young writers in the newsroom resulted in a professionalized set of teaching skills that could be applied in the classroom. To continue his teaching development, he became actively involved with workshops led by Teaching and Learning at Laurier. It wasn’t long until Gillespie began running his own communities of practice for instructors in Brantford. Berardi’s reflections on her experience with Gillespie’s project echo the importance of lifelong learning – regardless of the role you’re playing.